In my 25th year of teaching, I was a teacher of a split 5th/6th year class. It was a challenging school and a challenging class. Three months into the new school year, I gave my students an end of the term math test. There were 28 students in the class of mixed abilities. I spent a number of lessons reviewing what concepts to teach. I also showed students what concepts and questions to study. I knew they were ready for the test. The next day, I handed out the test and took it home for marking. None of them passed the math test. I was sure one of my students was going to get perfect. It came as a shock that not a single student passed. The class did not meet my expectations at all. Here’s what I told my students the next day. “First of all, let me say that I like all of you very much. I believe in you, I know you can handle it, I accept all of you. I want you in this classroom. On the very first day of school, I made a promise to each and every one of you – that this would be your best year ever. In order to keep that promise, I need something from you – I need you to do your best, to follow the rules of the classroom, to respect yourself and each other, to be responsible for your actions, to co-operate, to be a team. I have always believed that students should know where they are, where they’re going and how to get there. I’m not going to hold anything back – you all failed your math test. It’s feedback you may not want to hear, but one of the main reasons you all failed is because your behavior is impacting on your academic work. And that’s where I come in. It’s my job to help you be your best. One of the first things I’m going to do is to phone all your parents. They need to know. We’re also going to re-do the test. I will show you how to answer the questions. You all need to start taking your math home every night and reading out loud the questions, reviewing what we did in class and giving me feedback the next day on anything you don’t understand. You need to start talking to each other by phone, by text, through social media to help each other, to support each other. It was through education that I got out of poverty, my brother got out of poverty, my sister got out of poverty. That’s one of my most important values—the importance of getting an education. And that’s why education is free for everyone from pre Kindergarten to the 12th grade. We had a bad day, but tomorrow is a new day. Your parents want you to do your best. All of your teachers want you to do your best. Now, we need you to do your best. 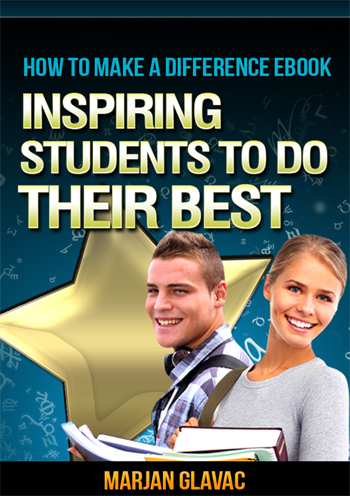 It also comes with a bonus workbook of 100 pages of activities, strategies and incentives to keep you and your class engaged all year long AND a 2.5 hour on-demand video (Total Value Over $150).